One of the most requested tutorials has been for the loose curls I sport most days. 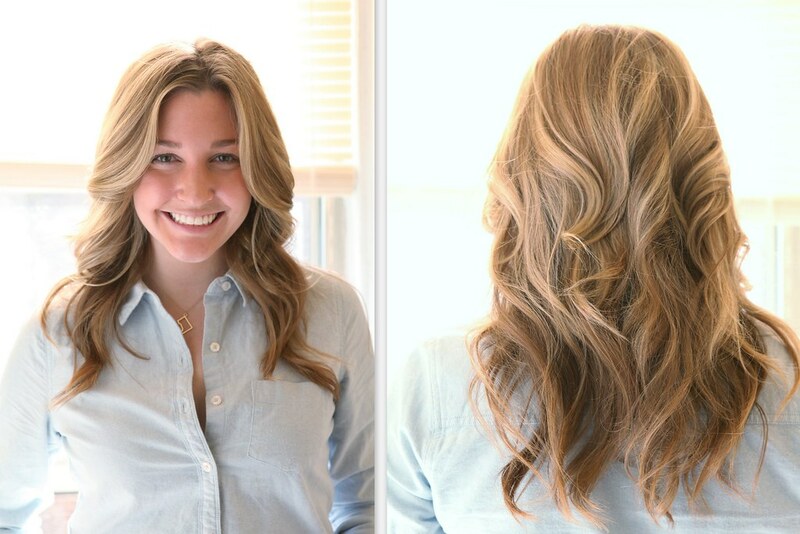 While there are tons of ways to achieve this tousled look I’m sharing my go-to with you today. Once you get comfortable with your new styling methods this ‘do should take you no more than 30 minutes & even less with second day hair. Towel dry hair. Use a wide tooth comb to detangle. Use a quarter sized amount of shine serum & work through hair starting at the ends to the nape of your neck. Next, use a dime sized amount of heat protectant & work through hair starting at the ends. Blow dry on the warm (not hot!) setting. I go a little crazy here – there’s no rhyme or reason to how I dry my hair. When most of the moisture is gone use a large round brush for a good blow out. Make sure that you are working the brush through the ends of your hair. Separate your hair into sections. I start at the bottom & work my way to the front. I also use a banana clip. Deal with it. I do not use the clamp on my iron. 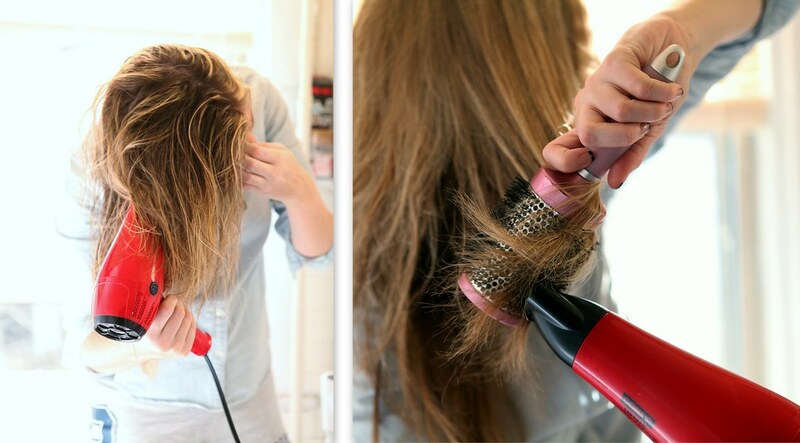 Wrap the section of hair around the iron & away from your face. Continue doing this until all sections are curled. 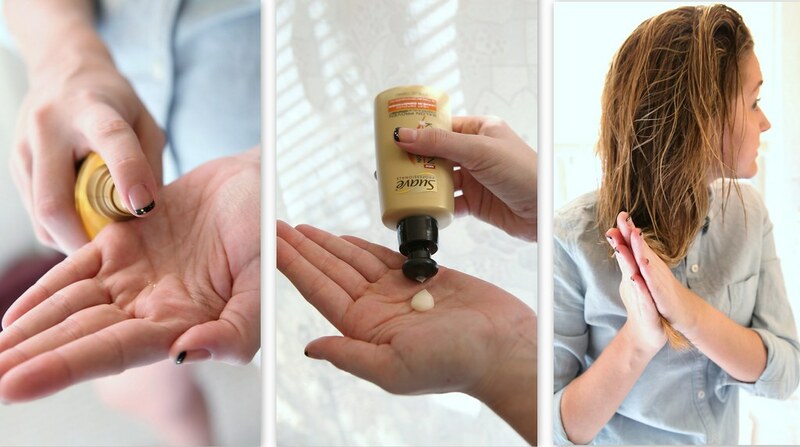 Use a dime sized amount of frizz control serum to break up the curls & smooth any flyaways. Now for my most favorite step: grab that unnecessarily large can of L’Oreal Elnett & spray until your heart is content. For the record, I drive a hybrid so there’s no way you can make me feel guilty for having a love obsession with aerosol hairspray. Good chat. Back to the hairspray. Once you have successfully contributed to the depletion of the ozone layer put. the. can. down. Et voila! You’ve got yourself a head full of carefree curls. *When working with second day hair, straight or curled, make sure you brush out the ends well & add a few sprays of dry shampoo & texturizing spray to your roots before curling. [Brunettes – make sure there is no white residue from the dry shampoo left on your roots – rub in thoroughly // Drybar now makes a dry shampoo just for brunettes!] Next, heat up your iron & get to styling! This is not a sponsored post. I simply have an affinity for magical life-changing hair care. Great tutorial! My hair doesn’t really curl like this, but I know so many other girls will love it! Love this! 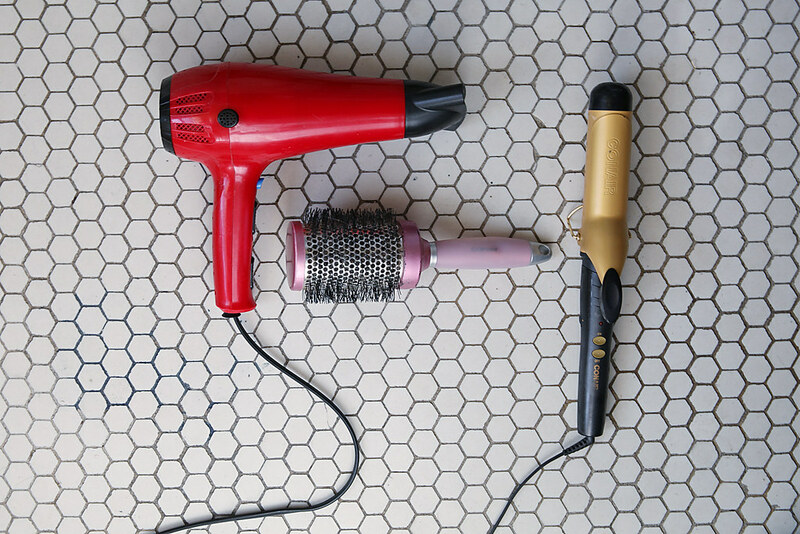 Does your hair slip off the curling iron? 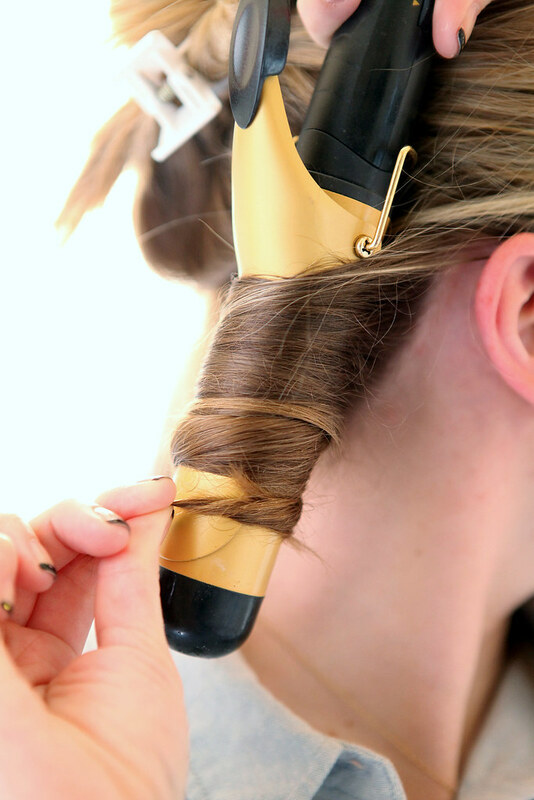 Every time I curl mine with the wand it does – that’s the only thing I have a problem with!! I’m going to have to check out the products you use! Just reading your question about hair slipping off a wand. My hair slips off a wand curler too, but on a clamp curler my hair does not slip off. Weird I know, but true! I don’t use the clamp, I wrap the hair like in her pictures, but I just thought I would tell you that and maybe it will work for you also. It might help to add a bit of texturizing serum or spray before curling. My hair is on the thicker side so it tends to wrap & hold curl well without this product. If only my curls looked that awesome!!! Thank you for sharing!!!! You’re hysterical! I’ve really been enjoying the blog and this post in particular was the cherry on top of my morning. Keep up the good work! I took the clip off of my curling iron a few months ago when clipless wands were all the rage and my curling iron fell apart! Clearly I’m going to reattach the clip and just not use it. GENIUS! I love seeing how people do their hair! I must say, I’m jealous at how good yours blow dries! amazingness … you look gorge, awesome tutorial , your results are perfection. This is amazing! I just received a clip-less curling iron for christmas and have been practicing! This tutorial was amazing. And your blog makeover is perfect! Love the DC flag-inspo! Great post. Your hair is lovely! I’m growing out a pixie, I can’t wait to curl it like this again! Following your lovely blog! Totally doable & would be so cute! I’d go with a smaller barrel but follow the same steps! It looks like your barrel is larger than 1 1/4″ – what size do you use?? I definitely have a 1″ barrel and it doesn’t make waves like that! help lol ! My barrel is 1 1/2″. You can also play with wrapping your hair tighter around the barrel in one place or setting it a little looser for beachy waves. I actually don’t touch my ends to the barrel when I’m curling . Since I don’t use the clamp I have to hold the ends of my hair & this keeps them away from the heat. I also prefer that the ends hang a little straighter so this twist works best for me. As far as product to protect from heat I would suggest the Kerastase & Suave serums listed above. They have completely changed my hair for the better. & don’t forget – you should never apply heat to your hair without a protectant! I drive a hybrid too and have zero shame for buying aerosol hairspray and dry shampoo. how many inches is your curling iron? My iron is a Conair 1 1/2″. 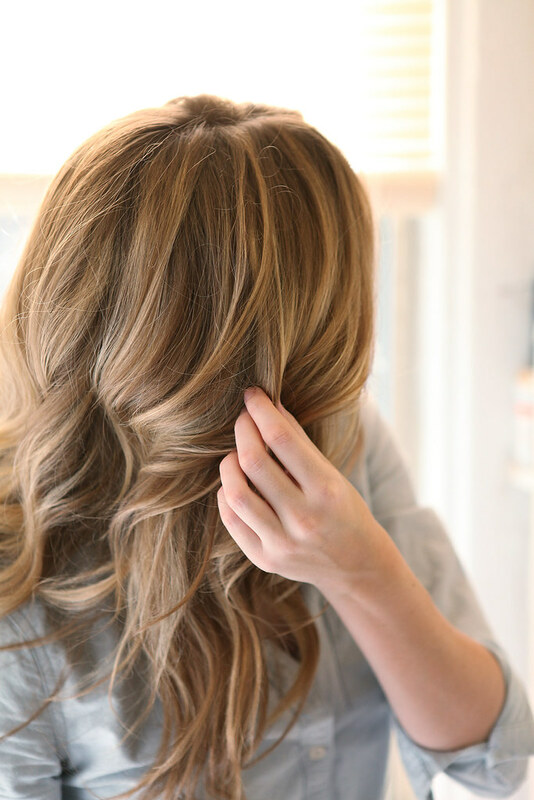 I use a lot of these same techniques, but I’m definitely pinning this for your product roundup — I’m always looking for new ways to make sure those curls stay soft and natural looking, great tutorial! 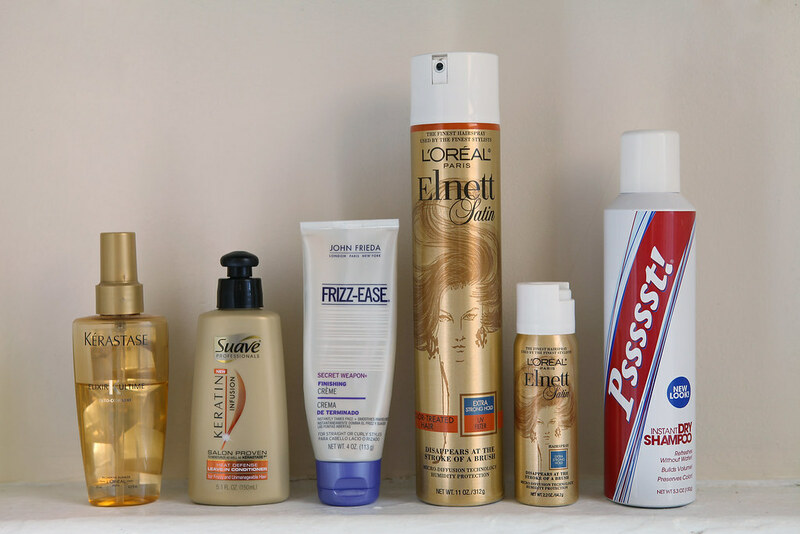 CFCs are no longer in aerosol hairsprays. Don’t worry about the ozone layer! 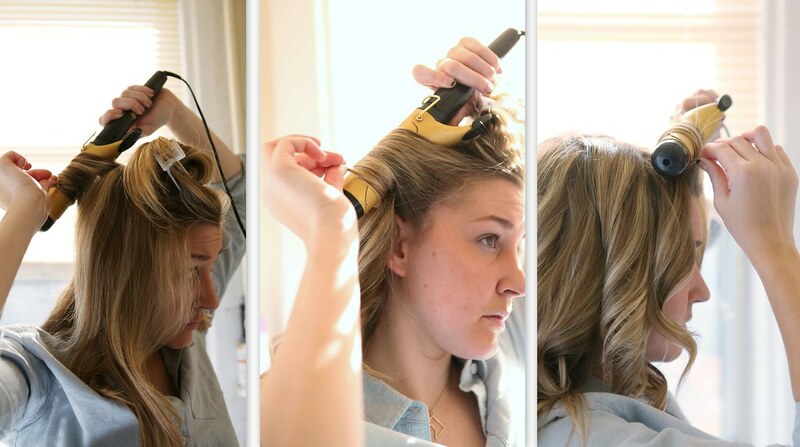 How long do you hold your hair on the curling iron? I am new to curling and still trying to figure out how long to keep it on. Thanks! It depends what kind of curling iron/wand you’re using because the heat ranges drastically. I would, very carefully, use two fingers to touch the hair on the outside of the barrel to feel if it’s heated all the way through. At that point release the wand & see if that’s the curl that you want. If not, curl that piece again & keep it on a bit longer. Don’t forget heat protectant! I think it rocks that you use a banana clip. They are the best! I also am wondering how you don’t get a line in your curl from not using the clamp? I have curled by hair this way before and end up with a doofy line… Lame. Banana clips rock! Do you get the line at the top or the bottom? I’ve noticed I get a line at the bottom if I leave too much of the end of the hair off the wand. Make sure to wrap it all the way around. Hope this helps!